Peachtree Residential is excited to announce that there is several recently completed homes that are move-in ready! All of them are located in great neighborhoods and children would attend top rated schools. More new homes and details can be found on our website at www.PeachtreeResidential.com Watch for our new website coming very soon! 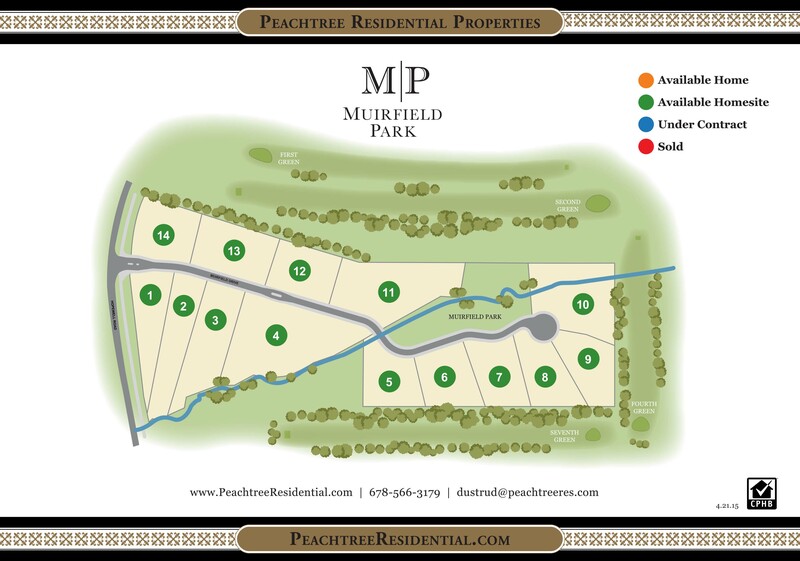 Muirfield Park is located in Milton and will have a grand opening in March and a brand new decorated model home. The luxury gated neighborhood has only 14 opportunities. Children will attend superior Northwest Fulton schools that include Cambridge High, Hopewell Middle, and Summit Hill Elementary. The executive homes have wooded acreage in a private setting located on Hopewell Road, just approximately 5 miles from GA 400. The neighborhood backs up to the famous Trophy Club golf course and the new upcoming Bell Park! the homesites range in size from 1 acre to 2.4 acres. Watch for more information soon on Muirfiled Pak! NOW PRE-SELLING AT MUIRFIELD PARK IN MILTON! For a limited time Peachtree Residential is offering a promotion on half off lot premiums for first two contracts! The gated community with new luxury homes surrounded by a golf course is priced from the low $800’s. All homes include 4 car garages and beautiful wooded acreage ranging from 1 to 2+ acres. The superior Peachtree Residential construction quality includes a 10 year warranty. There are only 14 opportunities in the neighborhood! The perfect location is only minutes away from Windward Parkway and neighbors to Trophy Club and Bell Memorial Park. Visit 3545 Muirfield Park, Milton GA 30004 to view the neighborhood. Onsite agent and decorated model home is minutes away at The Hampshires in Milton at 16350 Laconia Lane. 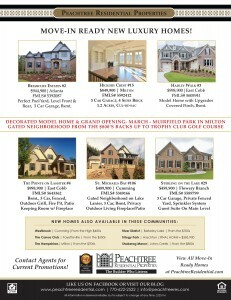 Visit our website at www.Peachtreeresidential.com to view floorplans and for more information. 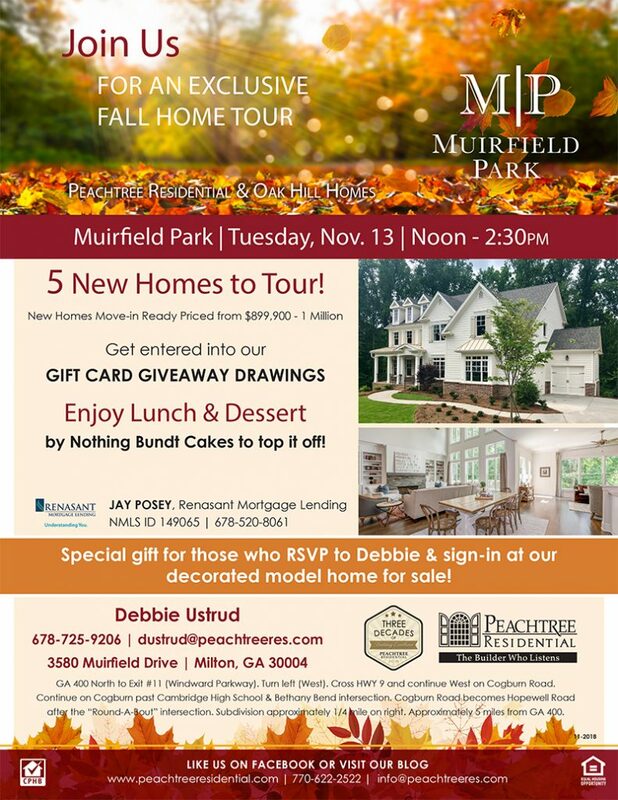 Peachtree Residential is now selling at Muirfield Park in Milton! There is 14 luxury executive homes to be built on wooded acreage in a private gated setting. This neighborhood is located on Hopewell Road approximately 5 miles from GA 400. Neighboring the Trophy Club of Atlanta golf course and the new upcoming Bell Park! MILTON NAMED BEST OVERALL CITY IN GEORGIA & 9th BEST CITY IN THE SOUTHEAST! Also voted one of the top five safest places to live in Georgia for 2015! Children that reside in Muirfield Park will attend top notch schools that include: Cambridge High School, Hopewell Middle, and Summit Hill Elementary. 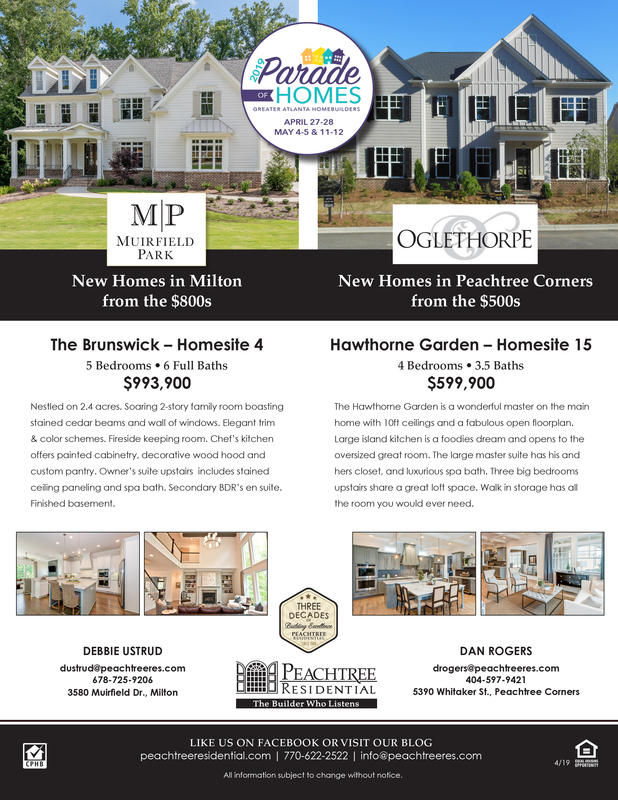 Visit PeachtreeResidential.com for more information on new homes in Milton at Muirfield Park or contact Sales Manager, Debbie Ustrud. dustrud@peachtreeres.com | 678-725-9206 | Decorated model home in Milton featuring the Cambridge floor plan available to tour at 16350 Laconia Lane in The Hampshires.